UC Irvine women’s volleyball rallied back from a 2-0 (18-25, 17-25) deficit to take the next three (25-23, 25-21, 15-12) against UC Davis (8-8, 0-3) at The Pavilion last Friday night, completing a five-set comeback to even their Big West standings at 1-1. Making their customary impact on their team, the junior trio of Idara Akpakpa, Harlee Kekauoha and Haley DeSales led UCI’s pack once again with contributions from numerous areas on the floor. Akpakpa paced the ‘Eaters with 12 kills in 22 attempts with just three errors (.409) while logging four blocks. DeSales, who also turned away four strikes, combined with Kekauoha for 20 kills, 10 apiece. While not hitting particularly well, Kekauoha made it up with four aces and nine digs. Collectively, the Aggies executed a near perfect game plan which was evident in the fact that they had edged the ‘Eaters out in kills (56-54), aces (10-9), blocks (14-7), assists (49-48) and digs (67-59). The Aggies also posted two game-highs as freshman Mahalia White brought down 20 kills while junior Malia Bolko had 26 digs. UCD’s attack was clicking on all cylinders right from the gecko, striking down the first point of the match and extending the lead, 9-5, on a 3-0 run. When the Aggies held a 16-13 advantage, UCI bounced back with the best effort that they had demonstrated in the match yet. Ignited from a kill by redshirt junior Ali Koumelis, the ‘Eaters went on a run of their own to knot the score up 16 apiece. Koumelis went on to play an integral part in the ‘Eaters comeback, finishing the match with 5 kills, 10 digs, and 40 assists. Despite the small surge, UCD answered with another trio of kills to create some distance again at 19-16. The Aggies did not look back, using their fifth ace on the set to cap it off at 25-18 and to go up 1-0 for the match. UCD did not slow down, breaking out of the second set on a 5-1 run that forced UCI to call an early time out. UCI’s stoppage materialized in a 4-0 run of their own to knot the match up at six apiece. 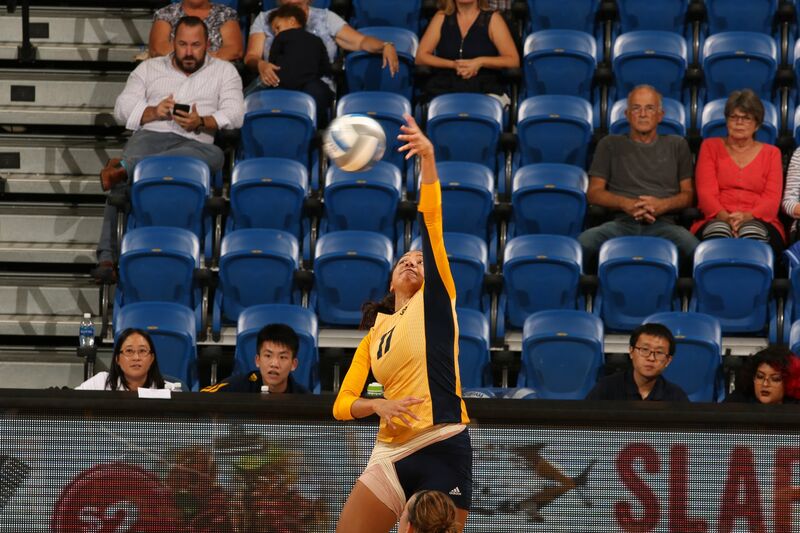 The ‘Eaters would then trade blow for blow with the Aggies, but after the teams were deadlocked at 8-8, the ‘Eaters experienced a dry spell as the opposition went for five unanswered — three kills and two aces — to go up 13-8. The ‘Eaters would not get any closer than four points as the Aggies sealed the second, 25-17, with another ace. Falling down 2-0, the ‘Eaters turned the third set into a slugfest. While UCD emerged with a 4-2 lead that they would later extend to 8-4, UCI did not let their opposition build on anything more than that, keeping within striking range until they found the rhythm on a 8-1 run to claim the lead and create some separation at 12-9. Holding onto the lead, a DeSales kill kicked off a crucial 4-0 run that would bring the ‘Eaters to set point, 24-22. An Akpakpa kill would then lock the third up and force the match to at least a four-set affair. An Aggie service error to kick off the fourth proved to be a sign of things to come as the ‘Eaters capitalized on the miscue with a double block from DeSales and redshirt freshman Danika Ferguson, who came off the bench for nine kills and two total blocks, to take on their first 2-0 lead to start a set on the night. Kekauoha soon found her rhythm on the service line, bringing down three of her four aces consecutively to bring the ‘Eaters up 11-6. Having caught fire, the Long Beach Calif. native struck down a kill and her last ace during a final 8-4 rally to take set four, 25-21. In an airtight fifth that began with six ties, the ‘Eaters went on a five point killing spree to earn a 10-7 lead. The Aggies stuck around on a pair of service errors from the ‘Eaters but after two untimely mistakes of their own, two Kekauoha kills completed the comeback, 15-12. Now with a .500 winning percentage in conference play, UCI will hope to increase their percentage when they return to the Bren Events Center Thursday night for their conference home opener against Long Beach State at 7:00pm. The ‘Eaters are currently unbeaten at home, going 4-0 in nonconference play.